With its special care formula of macadamia oil, jojoba oil and urea this After Shave Lotionprovides the skin with high-quality oils and moisture. Panthenol, natural vitamin E and bisabolol soothe the skin stressed by the shave and support it naturally during regeneration. 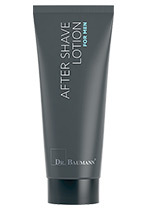 This lotion completes the shave and is of course also suitable for sensitive skin.